Authorities in Western Australia have seized a record 1.2 metric tonne shipment of methamphetamine. The meth haul, worth 1.04 billion Australian dollars ($800 million), is the largest in Australian history. The meth is believed to have originated in China. 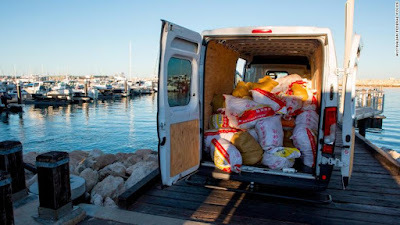 After being transferred from a ship off the coast, the drugs were offloaded from a vessel, the Valkoista, in the early hours and were being packed into a white van in the Port of Geraldton, 400 km (around 250 miles) north of Perth. Agents swarmed the van and the ship simultaneously, arresting six Australians. 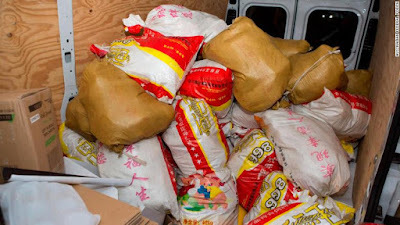 Police seized 59 bags of meth, also referred to as ice in Australia, each weighing 20 kg (44 lb) from the van, as well as one additional 20 kg bag from the Valkoista.